A pinguecula is an abnormal growth of tissue on the conjunctiva, the clear membrane that covers the white of the eye. 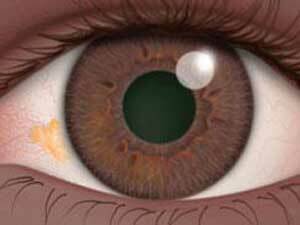 Pinguecula is a growth that looks like a yellow spot or bump on the conjunctiva. It often appears on the side of the eye near your nose. A pinguecula is a deposit of protein, fat, or calcium. Pinguecula usually does not cause any symptoms. It is most common in tropical climates and there is a direct correlation with UV exposure. 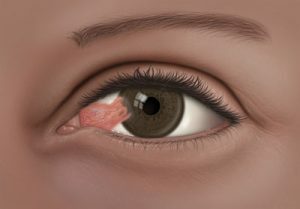 Pterygium may be associated with excessive sun or wind exposure, wearing protective sunglasses with side shields and/or wide brimmed hats and using artificial tears throughout the day may help prevent their formation or stop further growth. Surfers and other water-sport athletes should wear eye protection that blocks 100% of the UV rays from the water, as is often used by snow-sport athletes. Many of those who are at greatest risk of pterygium from work or play sun exposure do not understand the importance of protection.